Watching your loved ones play a contact sport can be nerve racking. The hitting or tackling can be vicious, which is why your children’s teeth can sometimes break or crack with contact. So, besides being their super fan on the sidelines, you should know what to do in the event of a dental emergency. 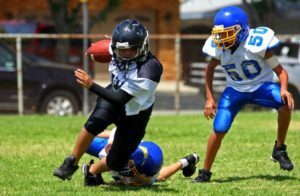 Keep reading to learn the steps you should take if your child breaks a tooth, and how to protect their smiles during all types of sporting events and physical activity from a trusted emergency dentist. If your child breaks their tooth while playing a sport, don’t panic. We know this is easier said than done but if you get flustered, so will your child. There are some things you can do to help them and ease their pain if they’ve cracked or broken their tooth. As a parent, this should be second nature. Do what you normally would and let your little one know that everything is going to be okay. Additionally, rinse their mouth out with cold water and then apply a cold compress to their face to reduce any swelling that can occur. Ask your child to open their mouth and let you take a peak to identify the broken tooth or teeth. Before you leave the field, rink, or arena, look for the tooth fragments that may have fallen out. If a permanent tooth is broken or lost, preserve it in a clean container with a moist solution like cold milk, water, or saliva if you cannot make it to the dentist immediately. Or, place the tooth back in your child’s socket and have them gently bite down on gauze or cloth if you can visit a dental practice straightaway. No matter what time of day, or part of the week, your dentist will most likely have an emergency number in their after-hours voicemail message. Let the dentist know what happened and schedule your appointment as soon as possible. If you’re unable to get the after-hours emergency phone number, you should consider taking your child into the emergency room for assessment. The best way to protect your children’s teeth during any type of physical activity is investing in a custom mouthguard. This is a comfortable and healthy way to prevent your child from injury. Mouth injuries occur most commonly in children ages 7 to 14, so protect their teeth from contact and concussion with a custom mouthguard. Now that you know what to do if your son or daughter breaks their tooth, you’ll be ready if an emergency strikes. Remember to relax, call your dentist in Carrollton, and make sure your loved ones use mouthguards during physical activity. Dr. Rajiv Shekhadiya and Dr. Dhiren Ahir are committed to practicing dentistry for the whole family. They know exactly what to do in the event of an emergency for your child, and will walk you through first aid tips and advice until you are able to come in. They currently practice at Celebration Family Dental in Carrollton and can be contacted through their website or by phone at (469) 892-6647.